The Chief Ministers Office, Government of Gujarat has been named esteemed recipient of the prestigious 2010 United Nations Public Service Award (UNPSA). State Wide Attention on Grievances with Application of Technology (SWAGAT) has won the UN Public Service Award in the category ‘Improving Transparency, Accountability and Responsiveness in Public Service’. The UN Public Service Award recognizes the creative achievements and contributions of public service institutions that lead to a more effective and responsive public service administration in countries worldwide. Through an annual competition, the UN Public Service Awards promote the role, professionalism, and visibility of public service.Spokesperson Ministers of the state government Shri Jaynarayan Vyas & Saurabh Patel outlined the brief of award & said that Gujarat’s award was handed out at the 2010 UN Public Service Awards Ceremony on 23rd June, in Barcelona, Spain, coinciding with the United Nations Public Service Day and Secretary to the Chief Minister, Shri A.K. Sharma received the Award. The Chief Minister of Gujarat said: “People’s voice is the key driver of a democracy, and listening to that voice is the key test of Good Governance”. The award comes as a result of the hard work of the administration at all levels: State, District and Taluka. Winning the 2010 UNPSA has rewarded the dedication of all the administration who have invested in the project. 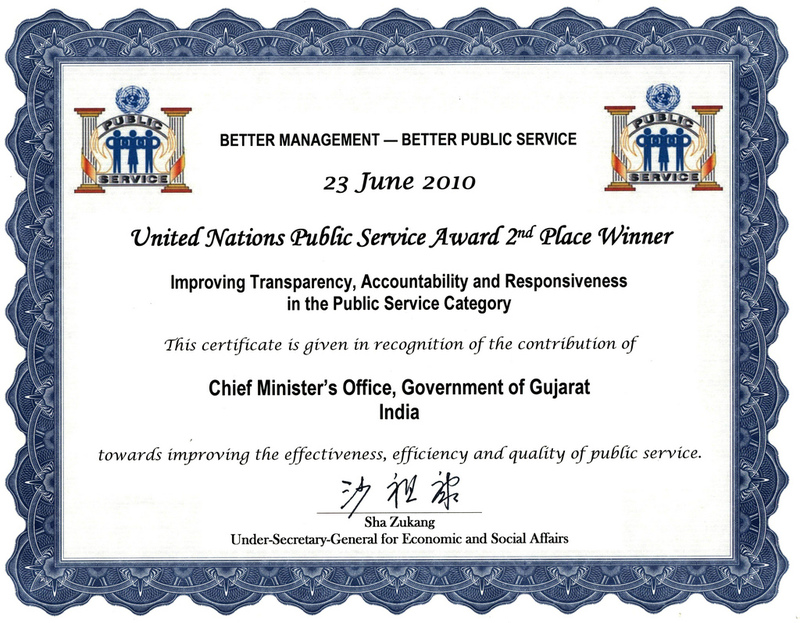 Few countries win the UN Public Service Award yet Gujarat has successfully managed to win this award in 2009, and now again in 2010. In 2009, Gujarat won the UN Public Service Award for Water and Sanitation Management Organisation (WASMO) in the category ‘Fostering participation in policy-making decisions through innovative mechanisms’. Gujarat is the only State in India to win the UN Public Service Award for the second time. SWAGAT operates on the principle that grievance redressal is essential for good governance especially to vitalize a democracy. Every month the Chief Minister considers grievance cases through multi-video conferencing with all 26 Districts and all 225 Taluka Offices. SWAGAT is outcome focused and cases are redressed on the same day or in a time-bound manner. This is the first time that the common citizen can access the highest level office with other officers present in real-time through video-conferencing. The advanced technology system allows attention and monitoring of grievances across the State to ensure resolution. SWAGAT operates across the state and has dealt with 50,585 cases at State and District level and 43,621 cases at Taluka level. 97% of grievances have been resolved since SWAGAT began in April 2003. At monthly State Sessions, Hon. CM reviews District and Taluka cases for quality of redressal and understanding the nature of problems at local level.